We had been looking at the stuff one can easily google regarding global temperature and large igneous provinces (LIP’s) and it seemed there might be something, so we dug in. There is an organization, largeigneousprovinces.org, that has excel data in some sort of Arcmap format. We were interested in big events so we set a standard of a million cubic kilometers of production. We took the total volume and spread it over the period of production. Sometimes you just have to concede that what little we know just doesn’t make much sense. The graph below is basically a study of our ignorance. The resulting LIP production is shown in red. The first surprise is that the vaunted Siberian and Deccan events that correspond closely to the PTr and KPg extinctions are not impressive in terms of volume. If these events played a part in the extinctions it was a qualitative and not a quantitative factor. The second surprise is the extreme “twin towers” bracketing the Cretaceous Normal Superchron and the high levels between them. It would be easy to develop an hypothesis that swings of polarity depend on internal pressures that when relieved by massive extrusions, reduce the dynamo’s tendency to flip. Another huge surprise is the low sea level during the Triassic. The steric (thermal expansion) rise of the current ocean is thought to be about half a meter per degree warming of the entire column. It was five degrees warmer then so an equivalent volume of the current ocean should have been a few meters higher than today. There were no glaciers storing water on land. Yet sea level was about 25 meters lower than today, and we live in an ice age. 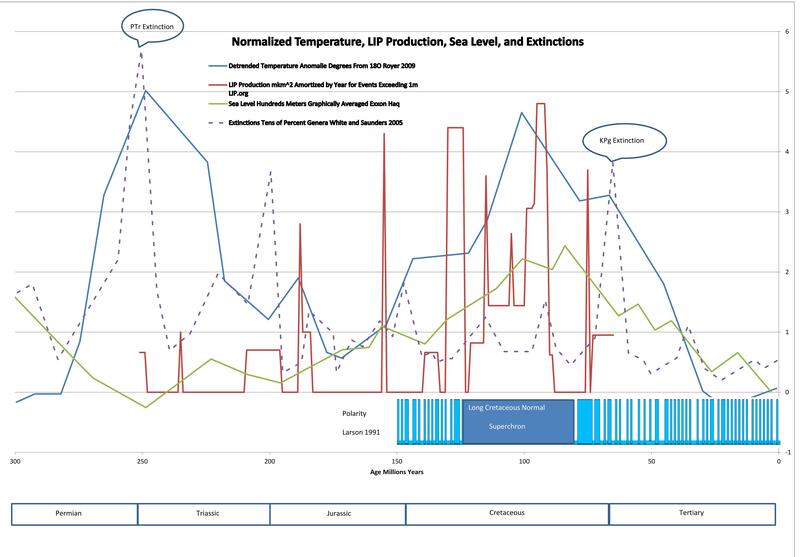 Furthermore, sea level continued to drop as temperatures began to recover in the late Permian and early Triassic and reached a nadir at about the apex of temperature. Really weird. This coincidence of low sea level and high temperature may speak more profoundly to the severity of the extinction than the Siberian basalt. The oldest surviving ocean floor is about 250 million years old and it is not until about 150 mya that we get enough floor area to accurately gauge the output volumes of LIP’s. So we really don’t know how much was being produced in the Triassic, but we do know that LIP’s are typically emplaced in isostatic “rises” that displace ocean and that the volume of basalt displaces more ocean, so it could be that the Triassic was a time of low volcanic activity. So why was it so bloody hot? It is quite clear that temperature has little to do with extinctions, at least when sea level is high. It seems that LIP’s have little to do with temperature. It seems temperature has little to do with sea level. So all we get is LIP’s raising sea level and temporarily switching the dynamo to DC? This entry was posted in Climate, Cretaceous normal superchron, Extinctions, Geology, Large Igneous Provinces, Magnetic Reversals, Paleo Sea Level, Paleoclimate and tagged Extinctions, LIP's, Sea Level. Bookmark the permalink.